BOOZE UP AND RIOT! Milk and Cheese are dairy products gone bad, and what that means for us is that they inflict brutal violence on plenty of well-deserving targets (and sadly a few that do not, but you can't have an omelet without breaking eggs). You can actually see Evan Dorkin's drawing style evolve and improve over the course of the book, and by the end of it his lovingly detailed full-page illustrations of shattering gin bottles, jaw-shattering punches and other types of mayhem are real works of art. Plus, it's got as many pop culture references per square inch as an average episode of "Family Guy" (but in a GOOD way). Highly recommended. they hate what you hate and they hate you.How my mother ever let me out of the house at 15 wearing a shirt that said "Gin makes a man mean" I'll never know. Thanks Dorkin. Forget flower power . . . brick power for life!The first time I picked this up several years ago, I loved it. The part of me that longed for new Beavis and Butthead episodes rejoiced. The part of me that used to spend hours in front of the television watching that episode of Ren & Stimpy with Ewalt and Abner trying to hang 'em some yunguns, yeah, that part of me was happy too. Which leaves me wondering what the hell happened. Where did that part of me go? I still really enjoy Milk & Cheese, but now I enjoy it because of the artwork, which is wonderfully overwhelming at times. The violence is so excessive that I still crack a smile when I see someone's tongue flailing in the wind as one of the protagonists nails their head with a hammer. There is so much going on in some of the panels that I still catch new things every time I look through this collection. I really enjoy the meta elements as well, the fact that Dorkin parodies his own formula at times, and the fact that Milk & Cheese break the fourth wall to critique their own performance. If you're young and pissed, this book is for you. If you're not so young and not quite as pissed, there's probably something in here for you as well. Only with the support of milk and of cheese can I today drink a pint of gin in one sitting and not wake up the next day wondering why I'm not wearing any pants in the middle of Union Square and it's 1pm in the afternoon on a Monday when it was a Tuesday morning when I started drinking. I think the nutrients and vitamins help. From cows. Like steak. I really like steak. My favorite exhortation from this book: "DRINK LIKE COPS!" This is a one joke comic, but it's one damn funny joke! For reasons that I can't fully fathom, I was immediately enamored with the images of Milk and Cheese. Was it the boxy heads or face filling features or the almost always in motion over-sized feet and hands. Maybe. But I suspect it really was the greasepaint Groucho eyebrows appropriately borrowed from the original menace of mayhem--unless you count Attila The Hun. There is really little point to all this but to wreak havoc--quite literal and visceral physical destruction--while being self referential and breaking the fourth wall but it is very amusing for awhile. Best read in small doses or enjoyed as originally published individually in various comic collections where they would benefit from clearly standing out from everything else around it. While each comic skewers a different subject, too often it is "second verse, same as the first". I almost always enjoyed them and suspect I would have enjoyed them more had I stumbled across them in the 80's when they originally debuted. Of course, I could never truly bad mouth anything that references and Merv Griffin, lawn darts and catching Monk at the Pussycat Lounge. And of course beating up a record store clerk at least in part because he'd never heard of Nat King Cole didn't hurt either. MERV GRIFFIN!Evan Dorkin's Milk and Cheese are archetypes for the kind of insane, violent, hilarious characters present in much of today's graphic and animated media, and while not originators of the style, they do it damn well. The psychotic nature of the duo, presented in pages saturated with dialog and beautifully detailed art, serves to bewilder, threaten, and indulge the reader with the raw chaos of absurd violence. Completely entertaining, this book will make you deep-belly guffaw, after which you'll feel bad for laughing at cartoon murder.A horrible, awful, terribly funny comic. One of those cult comics from the '90s, Milk and Cheese turns out to be surprisingly durable twenty years later. This is my first time reading it, by the way. I'd compare Dorkin's work here to Stephan Pastis's Pearls Before Swine (turning your focus squarely on social anarchist Rat). Good stuff. Glad I finally experienced it for myself. 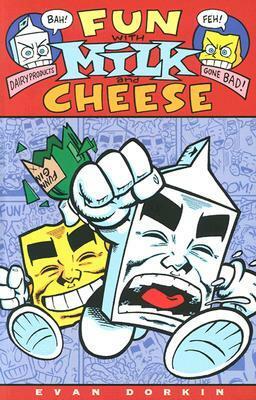 Comic book writer-artist Evan Dorkin almost seems to be using Milk & Cheese as a way of venting about (and laying to waste) all the things that make him dizzy with rage. Good god, this book must've been the ultimate therapy for him. If you're looking for anything resembling a plot, then you'll likely hate this. If, however, you're looking for pure anarchic mayhem, this book is just about perfect. This was LOL funny in high school (the late 1980s). Now it's kind of preciously asinine. Makes me nostalalgic, more than anything, for that time in my life when I could giggle over sketches of a carton of milk and a wedge of cheese inflicting violence on New York City. Even better than I remember it being when I was a kid. This book was way funny, but what I think made it even more funny to me, was that my copy was used from the Fargo Public Library with FOR CHILDREN all over it. Hmm I wish I'd read these when they came out and I was way younger. Missed the boat I guess! Don't really get it! One of my all-time favorite comics. I love this sort of weirdness. "I'm angry! We chose to go by the system! We played by the rules! We sold out! We bought in! Now...we RAMPAGE!" I LOVE THIS! Playful art, absurd characters, chaotic brutality.... This is very amusing. Everyone should read about the carton of hate and wedge of spite. Everyone. i found the comedy to be childish. there were a couple of "good" bad puns but otherwise it didn't grab me. i couldn't finish it. So, uh, it's about these "dairy products gone bad" named Milk and Cheese. Running amok, causing random chaos, good time. this is the best comic book ever. taught me all about random violence by a carton of milk and small hunk of cheese. so beautiful. 'when dairy products go bad!' oh, i blush! These are the kind of underground comics I wish more folks still produced! While some of the content is for shock value only, the majority of it is self-aware and satirical brilliance. Evan Dorkin - Evan Dorkin is an American comics artist and writer.